Vivian, who lives in the Salmon Arm area of British Columbia, Canada, shared her story with Goldie Denise Wellness regarding the pain relief she experienced with PEMF. PEMF is Pulsed ElectroMagnetic Field Therapy. Swiss Bionic PEMF Omnium1 Mat and Pad. I’ve had 5 or 6 treatments on the Mat. I was in a serious truck accident in 2000. The day of my birthday. I was hit by a drunk driver. Today I felt excrutiating low back pain. I used the Swiss Bionic PEMF Omnium1 Pad on that particular spot. It really smoothed and eased the pain right now. That 16 year old injury came forward today. Now my cells have Smiley Faces on them! Do you Suffer with Back Pain? Then you may be interested in Vivian’s story. 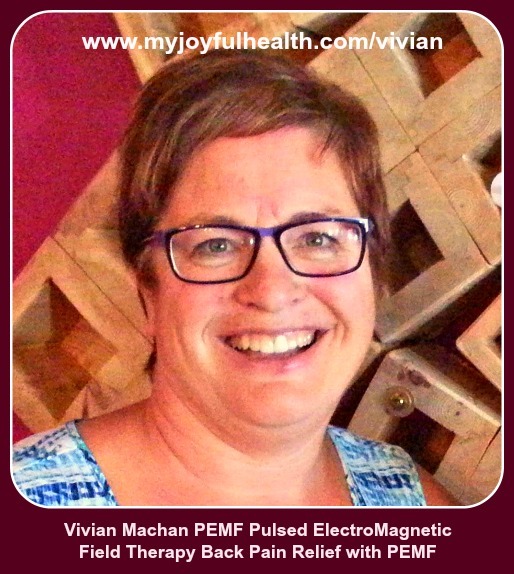 Goldie of Goldie Denise Wellness interviewed Vivian in August 2016 regarding her overall experience with the PEMF (Pulsed ElectroMagnetic Field Therapy) Mat and attachments. I’ve had 5 or 6 treatments on the Swiss Bionic PEMF Omnium1 Mat. Today when I used the mat, I had excruciating low back pain. I believe it is from a serious truck accident I was in, in 2000. I was hit by a drunk driver. So I feel it was bringing all that out in the lower back. I felt like there were 2 screwdrivers going down in there. I could hardly get off the mat, that’s how bad it was. Goldie: Did that scare you at all? No, I just knew I needed more Mat treatments. So I used the Omni Pad on that particular spot. It eased that pain right out. Goldie: This is the Pad attachment that actually goes deeper for old injuries. Vivian: So this is 2016. So that 16 year old injury came forward today. Goldie: Yes, what we are finding is that if people have old injuries, something that is chronic or acute, both those things come forward and you feel it to heal it. Sometimes that can be a little alarming for people. It’s good to understand it and allow your body to relax and feel these pains that are just there to be felt and then they’ll go away. My cells have Smiley Faces on them! Be sure and sign up for our newsletter below to learn more.